The three federal research granting agencies, the Canadian Institutes of Health Research (CIHR), the Natural Sciences and Engineering Research Council of Canada (NSERC), and the Social Sciences and Humanities Research Council of Canada (SSHRC), are consulting with stakeholders across Canada on the development of a Tri-Agency research data management policy. On February 15, more than fifty stakeholders from across the Atlantic region gathered at Dalhousie University and online to take part in a discussion with Matthew Lucas, who represented the granting agencies and is the Executive Director of Corporate Strategy and Performance for SSHRC; and Jeff Moon, who is the Director of Portage, a national network launched and supported by the Canadian Association of Research Libraries (CARL) that develops resources and platforms to support researchers and institutions in good data management practices. Participants included vice-presidents of research, university librarians, CIOs and other IT professionals, deans, and additional professionals from libraries and research offices. Similar meetings have already taken place with stakeholders in Ontario, Quebec, British Columbia, and Alberta. The agencies’ consultations build on the 2016 Tri-Agency Statement of Principles on Digital Data Management, which outline the agencies’ overarching expectations regarding research data management and the responsibility of researchers, research communities, research institutions, and research funders in meeting these expectations. The agencies believe that research data collected with the use of public funds should be responsibly and effectively managed and be made available for reuse by others whenever possible. Libraries and others in academic institutions are leading the charge to support researchers in adopting good data management practices. Researchers collect and rely on increasing amounts of digital data, but they don’t all have the tools or training to effectively manage this data. This creates a risk that sensitive data may be inappropriately released or that valuable data may be lost altogether. Insecurely stored research data may fail to meet ethical and legal requirements, or may become inaccessible due to hardware obsolescence. “Effective data management also helps researchers share their data more broadly, which in turn creates new opportunities to advance research. The benefits of this kind of data sharing are evident in disciplines like astronomy,” said Matthew Lucas. While the agencies recognize a number of factors that preclude data sharing, the agencies encourage researchers to provide access to their data whenever possible. In situations where sensitive research data cannot be shared, good data management practices are even more crucial to ensure that data is securely deposited and protected. · DalSpace, an institutional repository which collects, preserves, and distributes digital material produced by the Dalhousie community. · A recently launched data repository called Dataverse. Dataverse is an open source software application, developed at Harvard, that allows researchers to deposit, cite, preserve, and appropriately share their research data. · Data Management Services including access to the DMP Assistant, to develop data management plans. “Libraries are first and foremost concerned with providing equitable service. 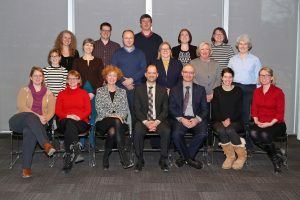 We serve all researchers, whether they have funding or not, so we are particularly interested in ensuring the research data management policies and the services we develop are inclusive for all researchers,” said Donna Bourne-Tyson, University Librarian of Dalhousie. “We were pleased to host this important discussion for the Atlantic region and to hear colleagues’ comments and questions,” said Bourne-Tyson. The agencies hope to launch a public online consultation on a draft Tri-Agency Research Data Management Policy later this year.